The 箆 (へら/hera; also loosely translated as nogata arrowhead-shaped spatula) shaped wooden board implements of the Late Jomon period excavated from the ruins of the Korekawa-nakai site (Hachinohe, in Aomori prefecture) are the “oldest” stringed instruments in the world. According to the current consensus theory, the “koto” was supposedly introduced into Japan from China during the Yayoi period. However, Mr. Suzuki, the researcher states these wooden implements are “Jomon koto”, not Yayoi koto, and has developed his own theory. The said ruins yielded eighteen “hera”, i.e. 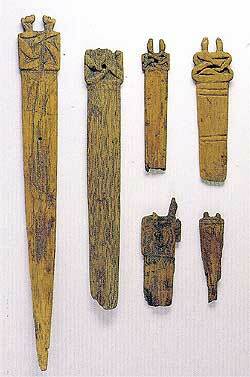 arrowhead-shaped wooden implements, from the site excavations in 1926 and two, in 2002. There are, however, various alternative theories of the possible usage of the wooden implement. Some say, it may have been a stringed musical instrument theory, others believe it might have functioned as a weaving implement. Mr. Suzuki, had undertaken a joint research project in 2009 with eighty-one-year old Director SASAMORI Takefusa, head of musicology studies (in the aforesaid Hirosaki Gakuin College). He created a survey map from a photograph of the “koto”, and built a replica out of “hiba” wood, and using hair and hemp, etc., for the strings…, then playing and sounding out music on the replica instrument. Although the pitch of such an instrument may differ with the size of wood, quality of the bowstrings, the volume of the sound, it is said, did not vary much — thus strengthening the theory that it functioned as a musical instrument. The average length of instrument is 55 cm. Researcher, Suzuki deduces from this fact, that it was “played by resting it on the lap”. It was said that the oldest stringed instrument in the world was the “shitsu” (a ten-stringed instrument and proto-type of the koto, was excavated from China’s Tomb of Marquis Yi of Zeng dated to the 5th Century B.C). A fragment of “hera” arrowhead-shaped wooden implement was also recovered from the Oshoro-dojo-iseki ruins in Otaru city, Hokkaido, which is dated older than the Korekawa-nagai-iseki ruins.